You have to have burgers at your Labor Day cookout. But who says they have to beef burgers? This Labor Day, end summer with some sizzle and bang, by making Cuban Pork Burgers. Juicy pork patties are smothered with a slew of sensational salty, savory toppings including melty Swiss, crispy bacon, and spicy mojo sauce. I made them last week. I ate one. Jeff ate one. We fought over the third. I won. Want the recipe? It's on the Pork, Knife & Spoon blog and is just waiting to be printed by you. I can not imagine you eating two burgers but I'd love to see you and Jeff "fight" over one! Happy Labor Day! Swiss, bacon and mojo sauce? Mmmmm... Happy Labor Day! 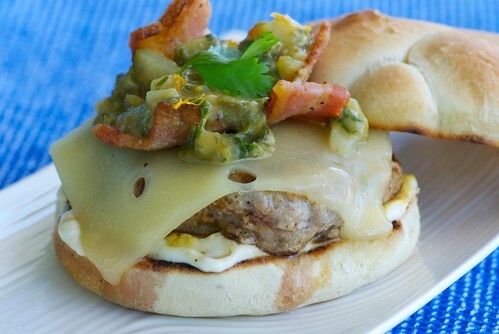 I'm a huge fan of Cuban food and this burger looks fantastic! This is the best looking burger I have seen in ages! I'm back on a modified protein diet and the only way to make it stick is to have lots of really delish things like cuban pork burgers minus the buns. Thanks for the recipe!